• A better calendar but held at last year’s price! Stocks are limited, so order today! You can but the calendar from me, from various other local Representatives of the Society, and online here. 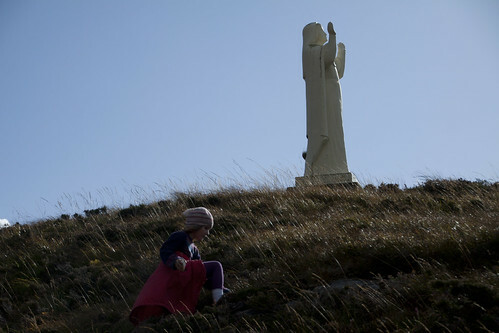 Advent Weekend of silent recollection: 2-4 December 2011. 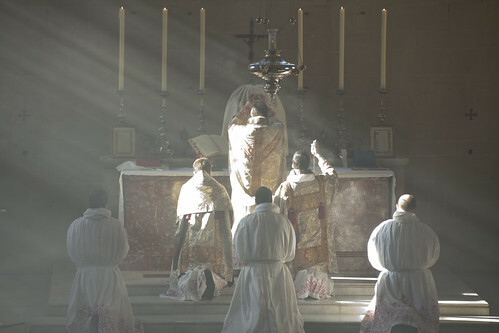 Led by Fr Armand de Malleray, FSSP. Location: Cold Ash Pastoral Centre, The Ridge, Thatcham, RG18 9HU, England. Cost per person full board single room: £120 (discount rate for full time students: £100). 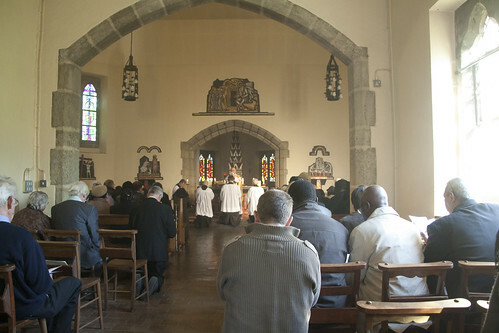 Programme: Spiritual conferences, Eucharistic adoration and Holy Mass in the EF each of the three days (i.e. Friday, Saturday and Sunday). 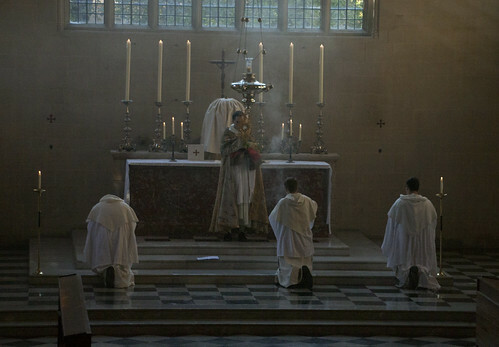 Booking: Please send us the £120 cheque made payable to FSSP ENGLAND (includes a non refundable £30 deposit). 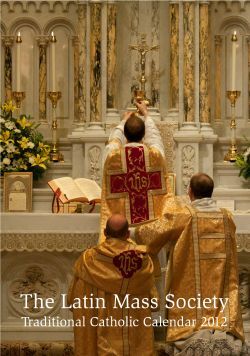 The Latin Mass Society will be holding its eighth training conference on the older form of the Mass from 16th to 19th April 2012. With the assistance of Fr Thomas Regan OSB, it will be held at the Church of Our Lady and St Michael at Abergavenny in Wales. Accommodation will be across the road from the church, in a former convent which has been converted into a very pleasant conference centre. Abergavenny is not far from the English border and is conveniently accessed by road from the English Midlands. Abergavenny mainline station is just over two hours from London and Birmingham and around two and half hours from Manchester. Tuition, which will be arranged in small groups, and will be tailored to suit the needs of each participant. In the case of clergy, it will be given by priests well experienced in the forma extraordinaria. 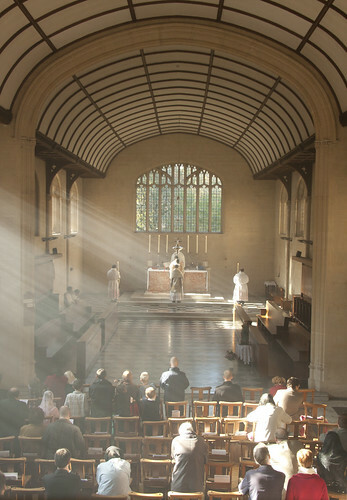 It is expected that there will be groups specialising in Low Mass, Missa Cantata and Missa Solemnis. The fee for attending will be £120, although there will be a concessionary rate of £60 for those unable to afford the full fee. 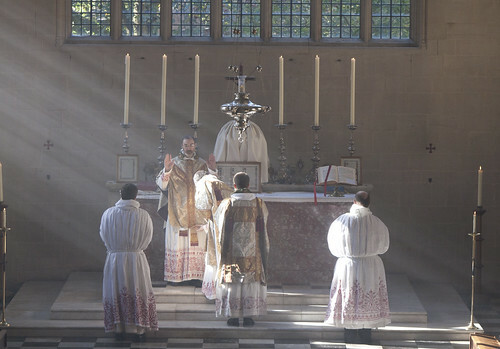 Application forms can be downloaded from the Latin Mass Society website. Following my post about the Mass here. 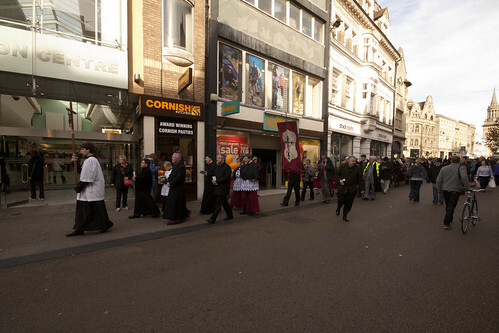 After a break for lunch, the pilgrims reassembled in Cornmarket for the procession, an integral part of the pilgrimage since its inception. We gathered outside St Michael at the North Gate, the oldest church in Oxford with a Saxon tower, from which (according to legend, at any rate) Archbishop Cranmer watched Latimer and Ridley being burnt at the stake. Next to this tower was the Bocardo prison, where the laymen martyred in 1589, Bl Thomas Belson and Bl Humphrey Prichard, were held the night before their execution (the priests were held in the Castle). The priests, Bl George Nichols and Bl Richard Yaxley, would have joined the others here to go in a grim procession to the place of execution, the Town Gallows. We follow that route, in a spirit of thanksgiving for their courage and witness to the Faith, and for the glory they gave God on that day. We set off, with Fr Thomas Crean OP. 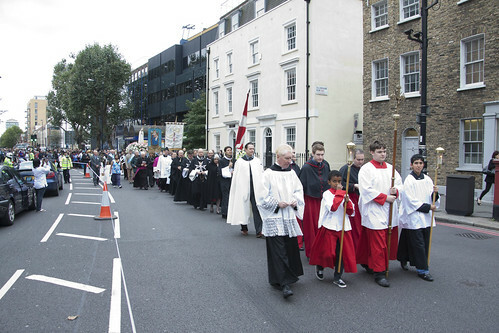 A processional cross (from Blackfriars) goes first, followed by the newly blessed processional statue of Our Lady of Walsingham, the LMS banner and the Juventutem flag. Then Fr Thomas, the Schola Abelis, and the rest of the Faithful. 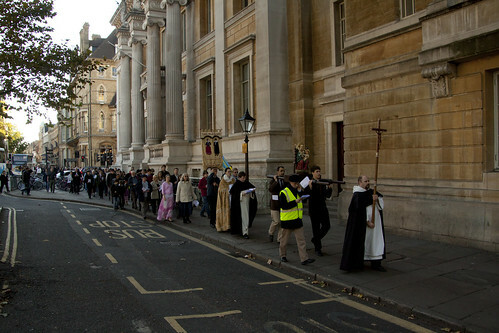 There were about 65 of us in the procession (there were about 90 at Mass). We passed a regular animal-rights protest. 'Oxford University tortures animals'. Well I suppose that's a step up from the torture of Catholics! University authorities were involved in the prosecution of the martyrs of 1589, and even more so in the legal process of Bl George Napier, who was martyred in Oxford in 1610. Bl Thomas Belson was an alumnus of Mary Hall, since absorbed by Oriel, and Bl George Nichols was an alumnus of Brasenose. 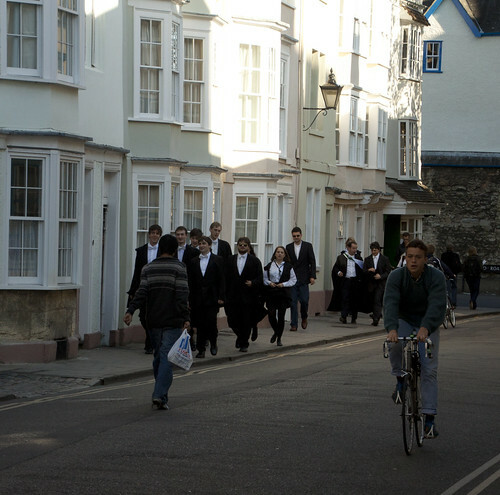 We also passed groups of students going to graduation ceremonies, and groups of tourists. We stop at the site of the martyrdoms. Among the scaffolding on the end house the plaque blessed in 2008, marking the approximate site, can be seen. 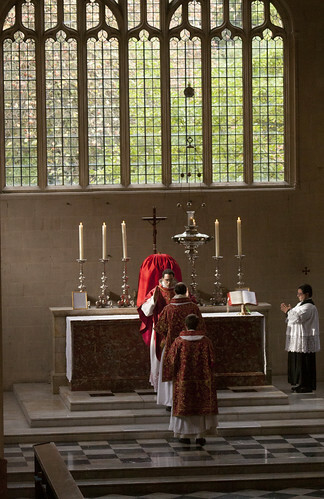 Fr Thomas read the Collect of the Mass of the Martyrs of Oxford University. Whereas the Catholic martyrs died on the ordinary public scaffolds of the town, Latimer and Ridley, and then Cranmer, died on a specially constructed pyre in the town ditch. 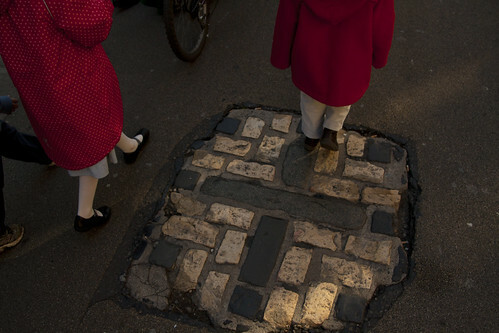 The spot is marked by a cobblestone cross in Broad Street, which we crossed on our route; here are two or my children on it on our return journey. We returned past the Protestant 'Martyrs' Memorial' and the Ashmolean. Fr Thomas gave us Benediction of the Blessed Sacrament. This was accompanied by the Schola Abelis, and concluded the Pilgrimage. 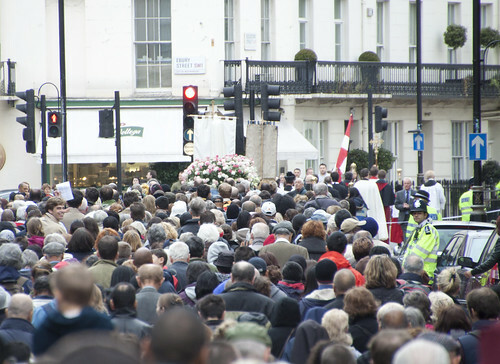 The weather was glorious and the procession was very enjoyable. We sang the Great Litany, the Te Deum, Faith of Our Fathers and Firmly I Believe and Truly, and finally the Litany of Loreto (of Our Lady). It is a bit shorter than the procession to the other site of martyrdom, in the Castle, where on the return journey we can fit in a couple more hymns! 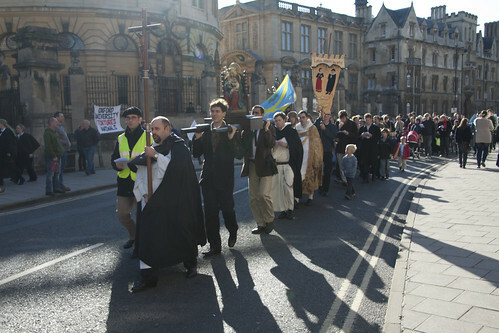 Well done to everyone who turned out to make the point that people died in Oxford for England's ancient and true Faith, for unity with the Pope in Rome, and for Our Lady. Blessed Martyrs of Oxford, pray for us! The equivalent date in 2012 is Saturday 20th October. 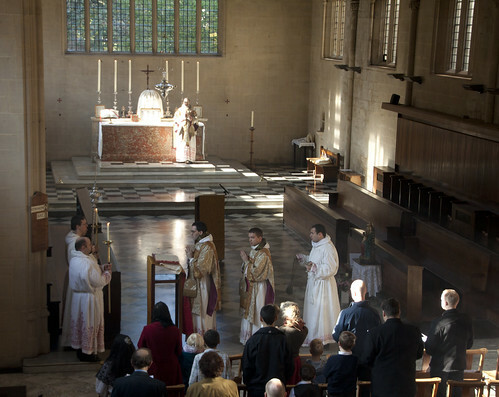 On Saturday we had the LMS Oxford Pilgrimage, with a Solemn Mass in the Dominican Rite. 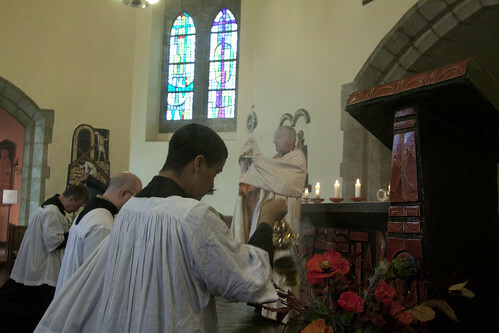 The celebrant was Fr Richard Conrad OP, the deacon Fr Thomas Crean OP, and subdeacon Br Gregory Pearson OP. In accordance with Dominican custom, there was no MC. 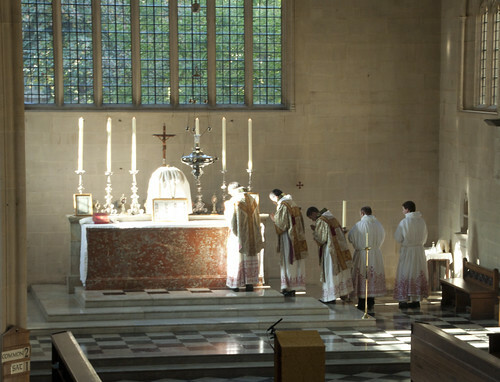 The acolytes were Dominican students of the Oxford community. This Mass did not disapoint. The ceremonies were performed with great precision and harmony, and it was truly wonderful. 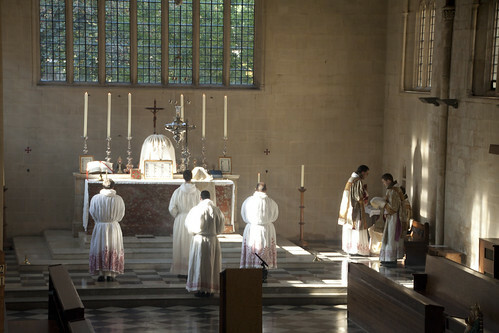 There were a great many differences between the Dominican and Roman Rites in Solemn Mass, which are fascinating; many of the Dominican usages reflect practices which were common also to Gallican and Sarum Rites, and would have been familiar in Medieval England. 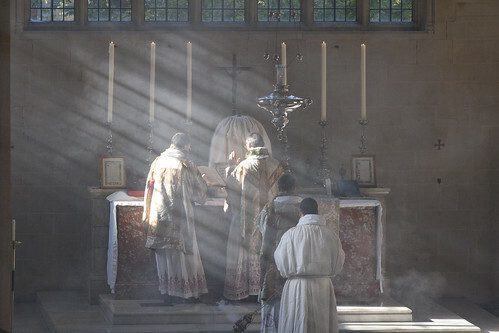 The Rite has a special beauty of its own. 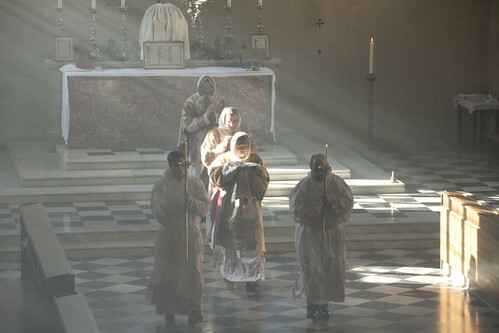 I particularly like the way the acolytes interact with the Sacred Ministers, as above and elsewhere. 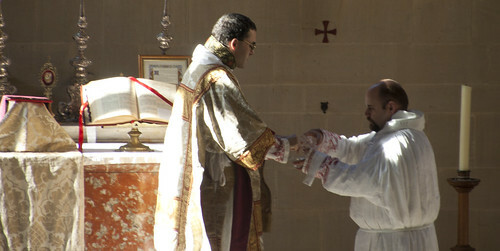 During the Epistle, the celebrant and deacon are given a piece of fabric to rest their hands on. 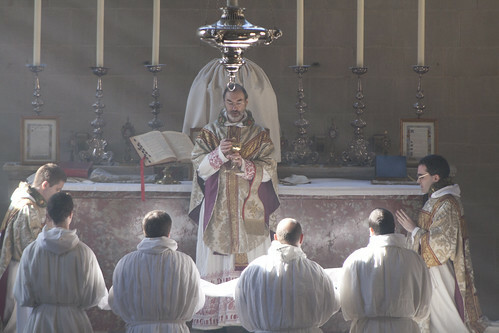 I have only seen this before at a Pontifical Mass. The Kiss of Peace, using a silver Pax. Ecce Agnus Dei, with a houseling cloth. 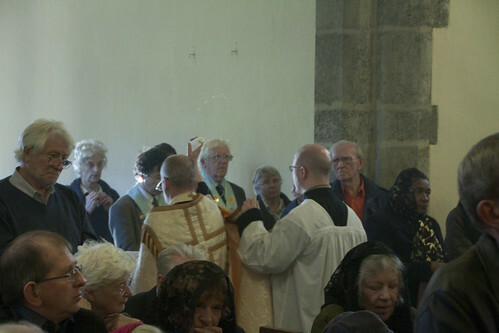 When the celebrant turns to address the congregation, as above, the deacon lifts the bottom of his chasuble. 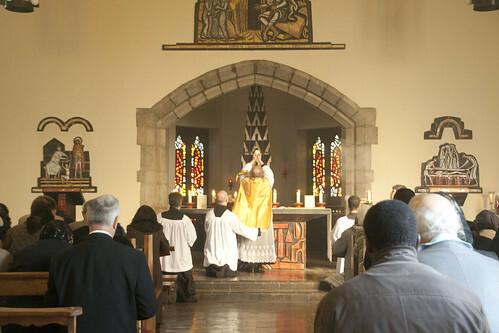 At the end of Mass the celebrant blessed a processional statue of Our Lady of Walsingham, which we used in the procession. 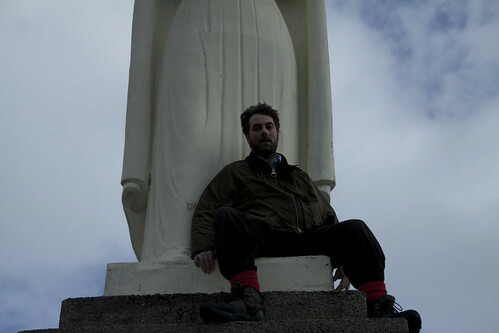 The Pilgrimage was wonderful, and I will write more soon. In the meantime, have a look at the Reluctant Sinner, and the Clever Boy, who were there; so, in fact, were Juventutem London and Juventutem Oxford! 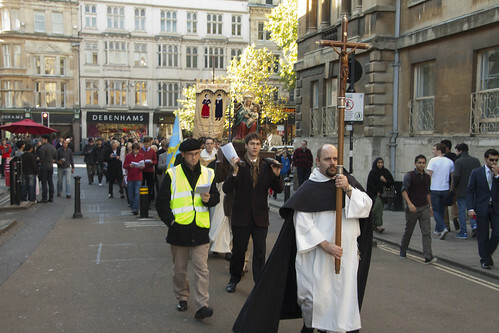 2pm Procession from St Michael at the North Gate, Cornmarket, to the site of the martyrdoms of 1589, and back to Blackfriars. 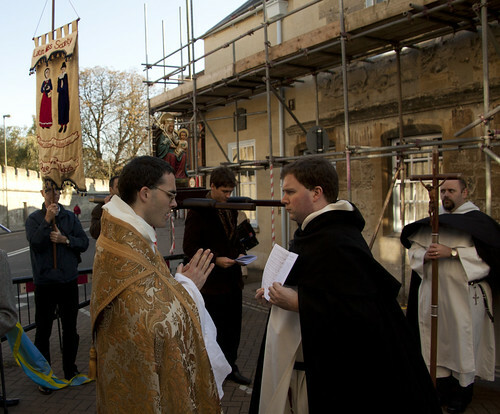 Please support the pilgrimage, which is a great witness to the Faith in Oxford. 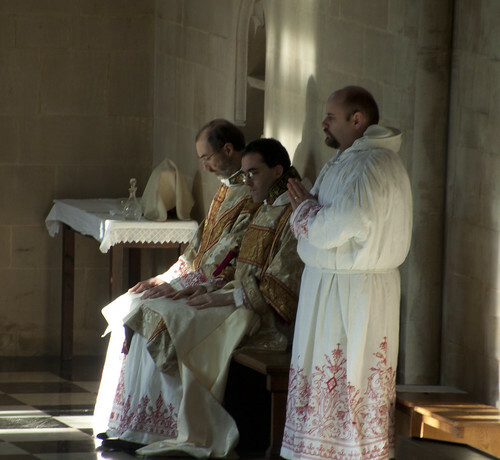 Highlights this year: the Dominican Solemn Mass, which we've never had before at the Pilgrimage. This will be accompanied with Polyphony and Chant by the Schola Abelis. The preacher will be Fr Guy Nichols of the Birmingham Oratory. 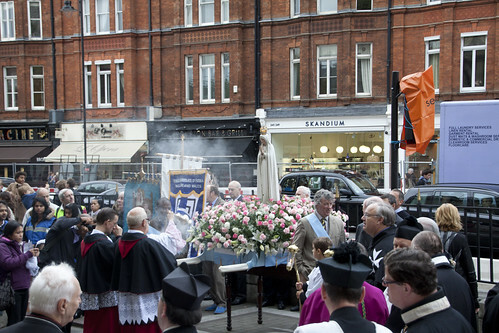 The procession and Benediction will be led by Fr Thomas Crean OP. We are reorganising the staffing structure in the Office, and are advertising two position, one full-time and one part-time. 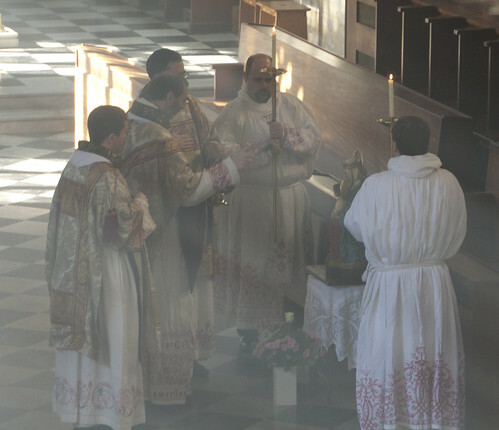 Would you like to work for the Latin Mass Society? There are also positions for volunteers - see the 'current vacencies' page of our website. The Office Co-ordinator will be responsible for the smooth running of many of our office’s day-to-day activities, and includes contact with our members and priestly supporters. General IT skills essential, as is a good knowledge of the Traditional Catholic environment. Full-time position. Deadline for applications: Sunday, 20 November. Download a full job description here. The Financial Administrator will be responsible for ensuring accurate maintenance of the LMS’s financial records. Experience of Sageline 50 essential. Part-time position (2 days/week). Deadline for applications: Sunday, 20 November. Download a full job description here. On Saturday the LMS Pilgrimage to Aylesford took place, and I was there. It hasn't happened for a couple of years, and has been revived by the new(ish) LMS Rep for Southwark North, Matthew Schellhorn. Fr Timothy Finigan celebrated a Sung Mass in the Relic Chapel at the Priory, gave a very edifying talk about the Four Last Things, gave us Benediction and blessed Brown Scapulars. 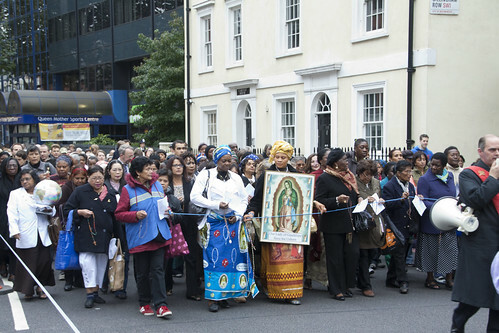 A packed coach came from London, and in all over 130 people attended Mass. The Relic Chapel, where St Simon Stock's skull is kept (in the tall ceramic structure behind the altar), was full, including the Reluctant Sinner, the Mulier Fortis, Smeaton's Corner and Juventutem London. 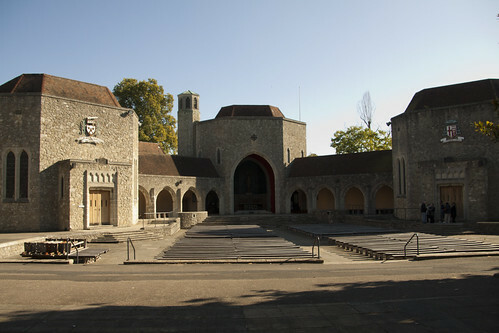 Aylesford is the place where St Simon had his famous vision of Our Lady, who encouraged him - the Carmelites had recently been ejected from their historic centre, Mount Carmel in the Holy Land - and gave him the promises associated with the Brown Scapular. 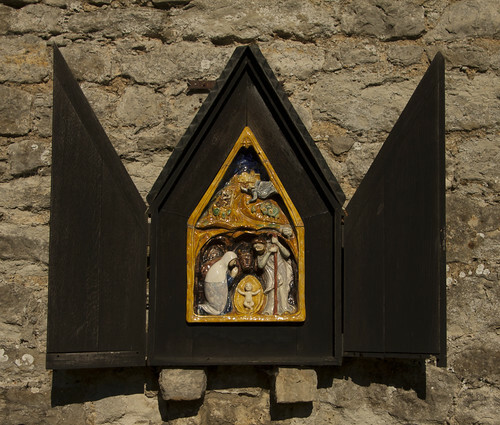 So Aylesford is an important shrine both to Our Lady and St Simon Stock, and is the world centre for the Brown Scapular, worn by millions of Catholics all over the world - and so popular among Traditionalists that it forms almost a (usually hidden) uniform. It was recommended by Our Lady again at Fatima. 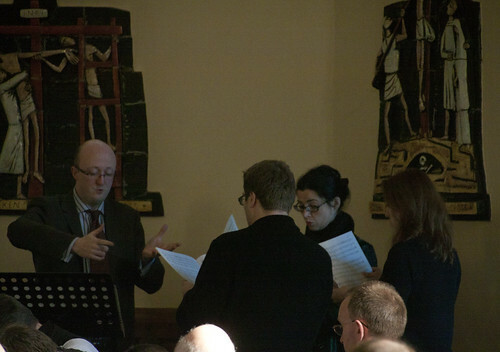 Music was provided by the superb newly formed choir, Cantus Magnus, which sings at the Juventutem London Masses. Here are the polyphonists being led by Matthew Schellhorn. They sang Machaut's Messe de Nostre Dame the earliest complete polyphonic setting of Mass by a single composer. Aylesford Priory is extremely impressive. 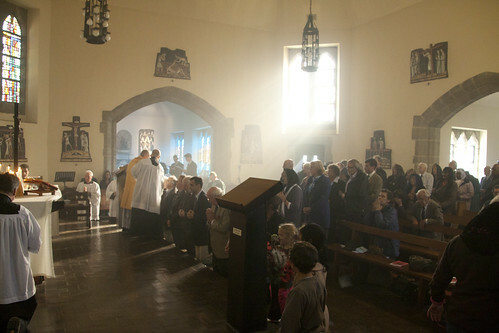 Here is the main chapel. The High Altar faces an open-air church, with chapels of varying sizes all around it. There is a Retreat Centre, tea shop and so on. There is a Rosary Walk with charming ceramic representations of each mystery. 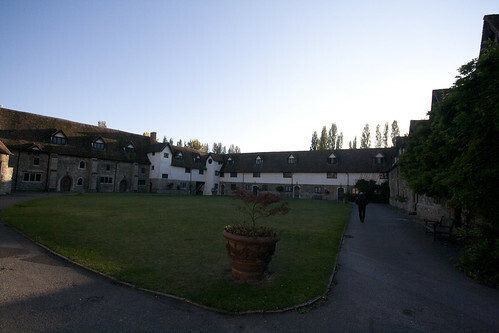 The Priory was of course dissolved at the Reformation, but some of the buildings were incorporated into a Manor house, and the Carmelites got the site back in 1949. 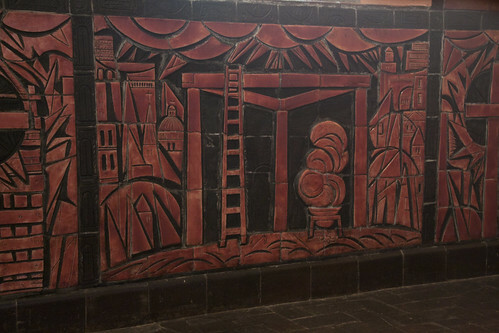 They completed the complex of chapels, with a vast amount of art in them, in time for the Shrine to be rededicated in 1965. (See the History page of the Aylesford website for more information.) There are many very interesting things to see: a side chapel to the Relic Chapel, for example, is dedicated to the English Martyrs: here is the Tyburn Tree. The weather was glorious, and the place is beautiful, peaceful, and prayerful. If you missed it, I expect it will be at the same time of year in 2012! Ok so it was just me and my 8-year old daughter while on holiday... but it was a real pilgrimage, it is about an hour's walk from the nearest bit of road, even at low tide. When the tide is low you risk your neck scrambling over the rocks; when the tide is high it is a much longer scramble over bog and hill. There was no way we could take my younger children. 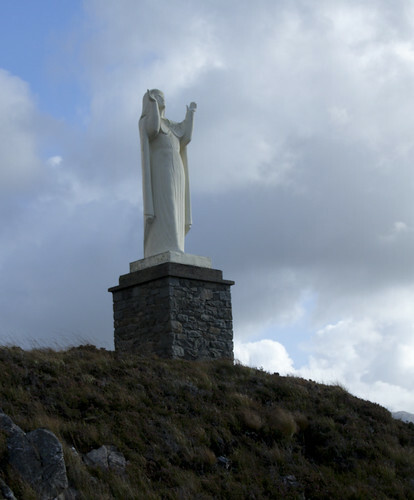 This very striking statue of Our Lady welcomes the boats into Loch Nevis, a sea loch near Mallaig in the West Highlands of Scotland. Going by boat by this route is the main, for most people the only, way to the Knoydart penninsula, and the statue was erected when the penninsula was owned by the Catholic MP, Oliver Crosthwaite-Eyre, at the instigation of his wife (as this web page suggests). He owned the place from 1952 to 1972, and is buried there. The statue dates from the earlier part of his period of ownership, I don't know the exact date. I was pleased to see signs of recent maintenance on the plinth, no doubt carried out by the current owners, the Knoydart Foundation. The statue has become an important landmark. The day was glorious and the views from the the statue's headland were breathtaking. 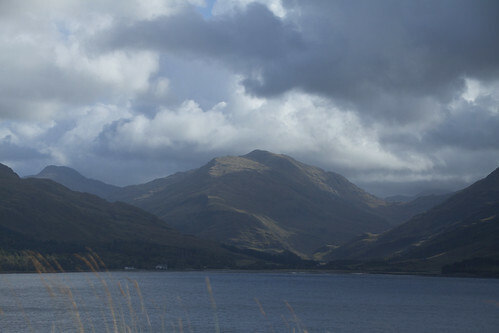 This is looking into Loch Nevis. Every inch of the West Highlands has a story to tell about Bonnie Prince Charlie, and as he hid out here for quite a while after his defeat at Culloden, before escaping to France, this is not surprising. 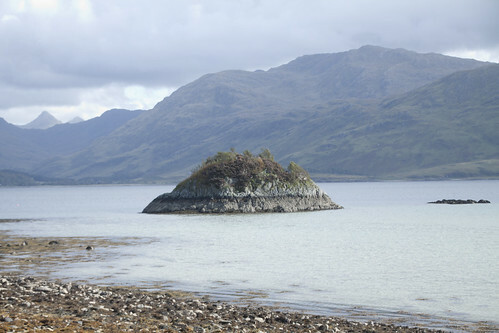 This island, not far from Our Lady's statue, is said to have been a place where he stayed the night. I am giving a talk tomorrow evening (12th Oct, 7pm) to the Cardiff University Students for Life group: see the Facebook event. It is my second trip to address the very active pro-life group there and I am looking forward to it. My talk is entitled 'Mercy, Murder, and Euthanasia', and will be in the Large Chemistry Lecture Theatre at the University. 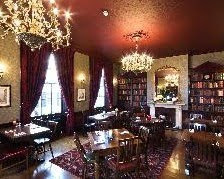 On Tuesday Oct 25th October 7.30pm I am giving a talk to the 'Inn Catholics': 'A Political Future for England - Saint Thomas Aquinas and the Common Good', at the Star Tavern, Belgrave Mews West, London, SW1X 8HT. There is no entrance fee (it says 'Voluntary contributions welcome'). The Inn Catholics, an informal group meeting to hear a talk in the convivial atmosphere of a pub, has recently been revived and was addressed last by Fr Tim Finnigan. See their blog. On Monday 14th November at 6pm I am giving a talk to the pupils of the Oratory School, 'Can Faith be Reasonable?'. 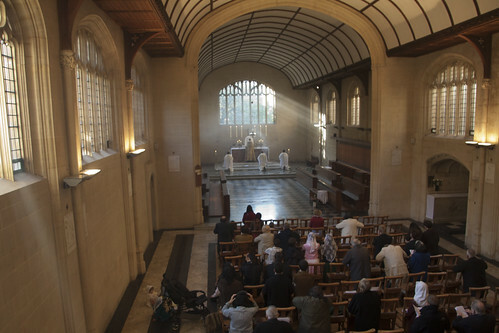 I was recently at the Oratory School for the Evangelium Conference (where, inevitably, I gave a couple of talks); it is also the venue for the St Catherine's Trust Family Retreat. This will be my first visit to see the school actually functioning as a school, and I look forward to meeting some of the boys! 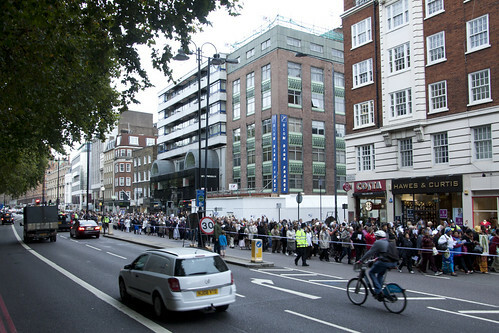 This is what happens when everyone gets going again after the Summer holidays, I fear: life gets very busy. I'm not complaining, however, I like the sound of my own voice and I agree to give talks whenever I can - on bioethical issues, faith and reason, the LMS, or pretty much anything. 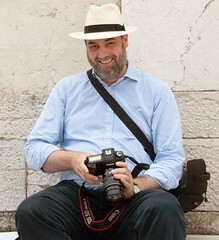 Here I am in full flow. A wonderful day. Join us next year!